Marcos is a combination of the surnames of the two people who started it all in Dolgellau, North Wales in 1959, Frank Costin and Jem Marsh. The word Xylon comes from the Greek for wood. Manufactured from 1959 to 1960 this was the first of the Marcos models. Powered by the Ford 105E (1 and 1.2 litre) engine, the cars were originally built in Dolgellau in North Wales, and then later in Luton. Of the 9 cars built, most were competition cars, and were driven with great success by the likes of Sir Jackie Stewart and Jackie Oliver. The Luton Gullwing, as it was known, was based on the Xylon. Introduced in 1962, when Peter and Dennis Adams 'replaced' Frank Costin and redisgned parts of the car, Cars were sold in both race and road form, and with the use of more fibreglass in the construction, a more streamlined shape was obtained. Utilising the same running gear as the Xylon, 13 cars were produced in Luton. The final model prior to the introduction of the classic Marcos two seater was the Fastback, introduced in 1963. 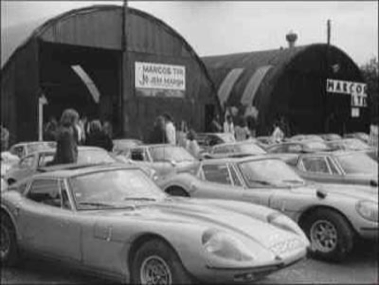 18 cars were produced, including the first ever Marcos Spyder, at Greenland Mills, Bradford on Avon - which was to be the home of Marcos for the next 7 years. 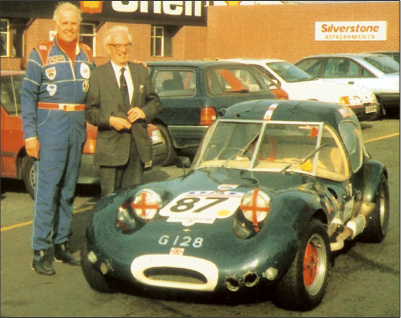 Unveiled at the October 1963 Earls Court Racing Car Show, the 1800 Volvo powered Marcos GT stole the show. This was a totally new car and a shape way ahead of its time, designed by the Adam's brothers. Produced from 1964 to 1966, there were approximately 100 cars built at Greenland Mills, Bradford On Avon. After the 1800 came the 1500, a wooden chassis car using the Ford 1500 GT pre crossflow engine. Under 100 cars were produced at Greenland Mills between 1966 and 1967. Based on the 1500, with the same wooden chassis, the 1650 was launched. It was fitted with the Chris Laurence 1650 engine, and around 30 cars were produced during 1967. The 1600 was introduced as a result of Ford introducing the 1600 crossflow engine. This was virtually identical to the 1500 / 1650, with a few minor alterations. 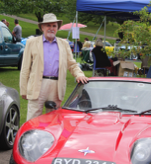 Of all the early series of cars, this proved to be one of the most popular with around 200 cars being built at Greenland Mills, Bradford on Avon between 1967 and 1969. The original Marcos Mantis was produced in 1968 and was a sportscar-prototype. Powered by a Formula 1 Repco Brabham V8 engine, It was a one off car built for racing, and was not intended for production. The only race was the 1000 km race in Spa in 1968, were it was DNF because of electrical problems , as the race was hit by severe rains. The XP now resides in the USA. The Mini Marcos began life in 1965, and was designed by Malcolm Newall. Production still continues by order only from Marcos Heritage. Over the years, then Mini Marcos gone through various forms and over 1300 cars have been produced. A Mini Marcos competed in the Le Mans 24 hrs in 1966 and finished 15th being the only British car to finish that year. In 1969 the 3 litre V6 Ford engine and gearbox were introduced. Modifications included an upholstered dash, power bulge on the bonnet and electric windows. 119 cars were built at Greenland Mills, Bradford on Avon. 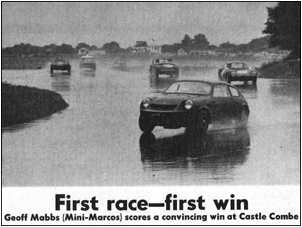 In 1969 now based in Westbury, Marcos introduced the Metal chassis car. Visually similar to the 3 litre wooden chassied car, but utilising a 1.5 inch square tubular steel chassis. 196 cars were made. Built from 1969 to 1972, with the American market in mind, Marcos went back to using a Volvo engine, this time the B30 straight six from the Volvo 164. The main external feature being the offset power bulge to accommodate the carburettors. 172 cars were produced. Between 1970 and 1971 the Mantis M70 was launched. It was the only four seater Marcos produced. The Mantis featured a 1.5 inch square section tubular chassis and ran the triumph 2.5 PI engine and gearbox. 32 cars were made in all. 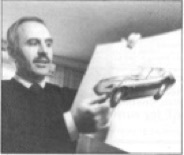 In 1971, the 2.5 Triumph engined car was available. This was based on exactly the same format as the 3 Litre Volvo, but using the 2.5 Litre carb Triumph engine and 4 speed gearbox. Only 12 cars were made and were externally indistinguishable from the 3 Litre Volvo. From 1971 to 1972, an economy version of the 1600 with a Metal Chassis was produced, utilising the Ford MK2 1600 cross flow engine and gearbox. The car had no bumpers, sills or head lamp covers. It was built to a somewhat basic specification. Only 6 cars were produced. Marcos ceased production and went into receivership in 1972. The 3 litre shape was then reintroduced in 1982 in component form to take the following engines: 3 Litre Essex V6, 2.8 Cologne V6, 1600 Crossflow, 2 Litre / 2.5 Triumph straight six, 2 Litre Ford Pinto and the 2.0 Ford V4. Around 130 of these self build cars were produced from 1982 through until 1989/90. The Mantula was introduced in 1983, based on the 3 Litre with revised styling, the Rover V8 engine and an updated interior featured. Very few of these cars were factory built, and approximately 170 cars left the factory between 1983 and 1992. Independent Rear Suspension was introduced to the Mantula in 1986 (both Coupe and Spyder models). It was fitted utilising a Ford differential, unequal length wishbones and rear disc brakes. IRS was available to both component cars and factory built models. The Mantula (S) was introduced in 1985. This was the first introduction of a convertible Marcos, bar the Fastback Spyder. Again, very few cars were factory built, 119 spyders were produced from 1985 to 1992. In 1991 the Martina was launched, it was based on the Mantula shape as a budget version of the model. Nearly all Martina's were component cars utilising the engine, transmission and suspension from the Ford Cortina MK 4 & 5. Both spyders and coupe were produced and engines varied from 1600 Pinto to Cologne V6. Approximately 80 cars were produced through until 1993. 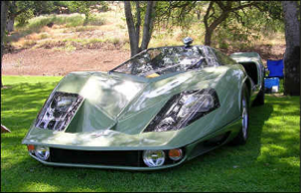 Based on the Mantula V8 injection, the Mantara was launched in 1992. It featured a re-vamped body and an updated interior. The main feature of the car being the front suspension that was modified to use the McPherson strut. All cars from this time onwards were factory built. The Mantara also had the option of fitting the 2.0 and 2.0 Turbo Tomcat engine. 137 Mantara's in all were produced at the factory in Westbury from 1992 to 1998. The LM 500 road cars were introduced in 1994 to compliment the success of Marcos in the British GT Championships in 1994/95 and competing at Le Mans in 1995. Powered by the 4.0 (LM 400) and 5.0 (LM 500) Rover V8 engines, 35 LM's in total were built from 1995 to 1998 including one LM 200 that was bound for Greece. The LM series of cars brought Marcos back into the fore front of GT racing in 1994. Two factory cars sponsored by Computacenter dominated. 7 cars in all were produced. The LM600 race car won the British GT Championship in 1995, 4 cars were built as homologated race cars, but not produced in road going form. These were the first cars to use the Chevrolet engine. In 1995 two LM 600 cars were entered for the Le Mans 24 hr, with drivers David Leslie, Chris Marsh, and Francois Migault in the number 71 car and Tommy Erdos, Cris Hodgetts, Cor Euser, in the number 70. Although the 71 car finished it was not classified as it failed to complete an appropriate number of laps, the 70 car suffered a drive train breakage and was unable to continue. Introduced in 1997, the Mantaray was based on the Mantara with a re-styled bonnet and rear end. Utilising the Rover V8 range of engines, and the 2.0 and 2.0 Turbo tomcat engine, 26 cars in all were produced from 1997 to 1999. In 1997, the Mantis was launched. It was a successor to the LM range of cars, and the most powerful road going Marcos ever produced. Powered by the 4.6 Ford Mustang engine and drive train, the Mantis displayed a more aggressive stance, and the GT version was available producing 500 bhp in a supercharged inter-cooled form. 51 cars in all were produced from 1997, the last being built in 2002 by Marcos Heritage. 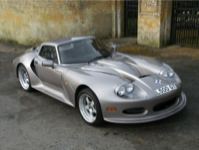 The Mantis challenge car was produced for the Marcos one make race series in 1998 / 99. Running the Ford Mustang engine, it was built to full FIA race specification. 38 cars were built and many of which are still performing to this day. 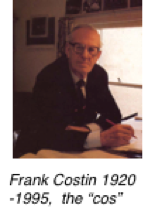 In 2000 Marcos Sales Ltd was put into administration and the assets of the company were acquired by Marcos Heritage. In 2002 Californian Tony Stelliga bought the Mantaray II project and developed the range of TS cars under the company, Marcos Engineering Ltd. The TS 250 (Marcasite) was launched in 2002. 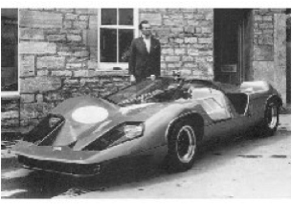 Based on the Mantaray it ustilised the same Marcos steel chassis and McPherson struts as per the earlier Mantara, LM and Mantis models, but was developed with the Ford Duratech 2.5 V6 engine. Only 7 of these cars were made. In 2003 the TS 500 came along with a restyled bonnet and was fitted with a 5 Litre Rover derived V8 Javelin engine. Less than a handful of these cars were made. 2004, Marcos Engineering Ltd moved out of Wiltshire and into new premises at Kenilworth in Warwickshire the TS 500 was phased out and the revamped TSO range appeared. In 2005, Marcos Heritage launched the Heritage MK VI derived directly from the Mini Marcos MK V from the 1990's with subtle updates. 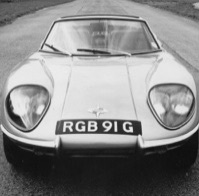 The car was only supplied in component form in both Road and GT versions. The TSO range incorporated a 5.7 litre Chevrolet engine into the restyled Marcos. The styling broke away from the traditional Marcos profile incorporating many new features bringing Marcos into the 21st Century. Shortly after the TSO came along, the GT, GT2, GTC and RT versions were launched spanning from 2004 through until 2007. Less than 12 cars in all were made. The TSO GTC is a classic British race-inspired 2-seat sports coupe that comes with racing suspension, racing brakes and a rear diffuser. The GTC is priced at £49,950. The TSO R/T delivers a thrilling open top driving experience with dual removable roof panels - combining a roadster experience with the safety, confidence and styling of the coupe. The R/T comes equipped with touring suspension, cargo nets and premium sound and is priced at £53,950. Both models come standard with a 420 horsepower Aluminium V8 Engine and a 6-speed manual gearbox. A 462 horsepower Performance Pack is also available. TSO’s are being delivered this summer to the Marcos Dealer Network. “The TSO’s combination of tuned V8 power and lightweight design delivers both stunning performance and breathtaking sound in a reliable, precision Engineered and affordable British Supercar”, said Tony Stelliga, Marcos Engineering’s Managing Director. The TSO is professionally Engineered. Composites and components are CAD designed and fabricated in England. The Chassis is Engineered and manufactured by Prodrive - a leading developer of motorsport chassis and race cars that have earned five British Touring Car Championships and six World Rally titles. Designed to be lightweight and responsive, the TSO inspires confidence and is communicative up to and beyond the limit. The TSO is reliable - with the same proven V8 Engine and drivetrain components found in the Corvette and Monaro. Induction, exhaust and electronics modifications by Marcos further enhance the TSO’s drivability and performance. The TSO is a performer – a lightweight composite body, space frame chassis and V8 engine provide an impressive power-to-weight ratio. With the Performance Pack the TSO accelerates to 60 mph in 4.1 seconds and to 100 mph in 8.5 seconds. Huge 340mm AP Racing brakes deliver a 0-100-0 time of 12.9 seconds. Overtaking is effortless with a 50 to 70 mph time of just 2.1 seconds. Top speed is over 185 mph." 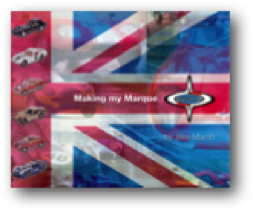 The Marcos name is kept alive by the devotion of enthusiasts through The Marcos Owners Club, Mini Marcos Owners Club, and Club Marcos International and of course the work of Marcos Heritage Spares Ltd. But, like a phoenix, will we again see the name Marcos rise from the ashes? Every attempt has been made to ensure accuracy, all trademarks acknowledged. 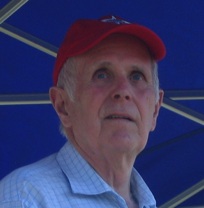 If you have a picture of Peter that is not subject to copyright please email. It all started with this, affectionatly known as 'the Flying Splinter', which resurfaced in the summer of 2015. Designed by Frank Costin. Originally it had a roof fitted but this was removed to go racing.